My photo of the day. 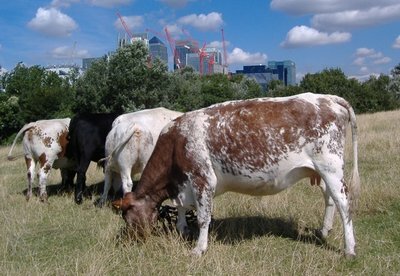 It was taken at Mudchute Farm, which is just down the street from my flat. Mudchute is kind of an odd name, I will admit. The area is named such because much of it is land fill from the creation of the docks to the north and west of the area. Silt from the channels and basins dug for nearby Millwall Dock were dumped on the area using a conveyor system - the mud chute. The area, with the rich soil from the river bottom and marsh quickly blossomed (literally) and became both a park and a farm. 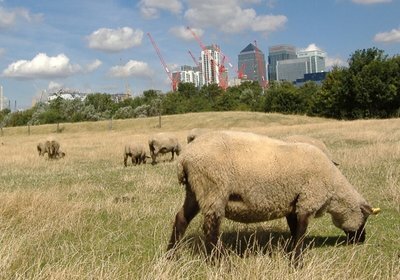 The park, just south of the farm, was the original field where Millwall FC played their games in the late 1800s. They then bounced around to a few different locations before landing on the south side of the river in an area that definitely isn't Millwall, but the Lions still kept the Millwall name. 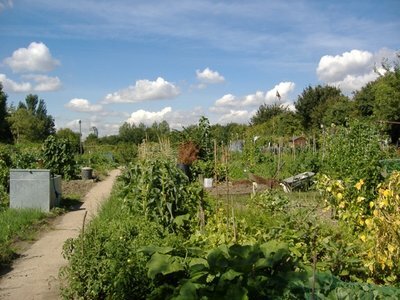 The farm today provides allotment gardens for those that want to grow their own fruits and vegetables. 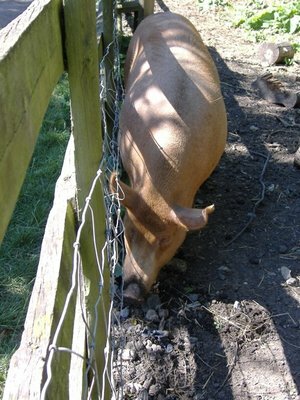 In addition, they have pigs, chickens, llamas and donkeys on display for the kids. But the coolest thing is the sheep and cow pasture, where you can wander around and get right up close and personal with the animals. The sheep and cows are pretty used to humans, and you can go right up and pet them, if you so wish. Right after I took this picture, the black cow came up and took a good, long sniff at my camera, trying to figure out if it was edible. Luckily, she figured out it wasn't, and moved on. Saves me from having to buy a new camera!